Last month I traveled to one of the most beautiful places on this planet - Iceland. It's everything that you've seen on social media and more! I will tell you right now that the photos of Iceland will never even truly describe how beautiful and wondrous this country is! You need to get there and experience it for what it is. If Iceland is not on your current bucket list I really hope my post inspires you to go because I promise you that you will not regret it for one second! So get your bags ready... here's Iceland in 3 Days! After a quick 5 1/2 hour flight with Icelandair from Chicago, Ohare to KEF Airport, Iceland we hopped on a shuttle right outside the airport which took us right to our car rental. We rented our Subaru through Lotus Car Rental which was the ideal choice if you want to see Iceland at your own leisure! I'm sure many of you have read about Iceland's roads being dangerous and the weather being quite unpredictable - the roads indeed can be quite rough so I do recommend keeping that in mind as the terrain is quite different. Believe me, I had doubts as well that people were being a bit dramatic, but it's the truth. As for weather we totally lucked out with gorgeous blue skies for all 3-days of our stay so the weather conditions for us were ideal. You should definitely download a local app that updates you on weather conditions and emergencies such as volcanic activity (112 Iceland is recommended). None of this should steer you away from traveling here. It's merely a precaution recommended by locals. After getting our car rental we drove to the Blue Lagoon. This is one of the most popular destinations in Iceland. My fiance and I chose to do the luxury Retreat Spa package which gave us some privacy away from the tourists. For the price, it's totally worth it for two people (or even solo)! What does this include? You have a private changing room which has lovely amenities! You receive a take-home travel set of the Blue Lagoon Silica Mask, Algae Mask, and Lava Scrub along with their amazing body lotion! You get a robe and slippers to walk around in which are ideal so you stay nice and toasty. There is also a wonderful private seating area with fireplace where you can enjoy free fresh fruit, water, tea, or coffee. There is also an option to order food of their Lava Restaurant menu if you'd like. The Retreat Spa package also gives you a private entrance to the lagoon which was really nice allowing you to come and go as you please. This is the ideal way to start off your adventure in Iceland and I cannot recommend it enough! We spent about 2 hours here total, but you have up to 4 hours to utilize and it was worth every second. I should also note that there are only 12 groups allowed at a given time and when we went in the morning around 8:30 AM there were only 2 other couples there so it was perfect! After a relaxing spa experience, we began our journey towards the town of Vik which is where we decided to stay for our first two nights in Iceland. The nice thing about Vik is it's centrally located halfway between the east and west coastlines (Click here to get an idea). Along the journey, we found ourselves stopping on the side of the road numerous times to take pictures of the beautiful landscapes which included numerous smaller waterfalls, the seaside cliffs, beautiful churches poised perfectly against gorgeous scenic backdrops, and one of my favorite moments which was stopping and taking pictures with the Icelandic horses! While traveling across Iceland you will get a few opportunities to stop and take some pictures of these beautiful creatures. The way the wind blows their hair makes for a perfect photo or video not to mention they're super friendly. So if you're like us you might take in this moment and give them lots of love! After getting caught up bonding with the horses we drove for a while longer until we reached our first major destination on the road to Vik. Our first stop was Seljalandsfoss Waterfall! What I found fascinating about Iceland is how the landscape continued to change as we drove across the country. You will find yourself in flat lands which then suddenly turn into lava fields covered in moss. You would cross over bridges with the most amazing streams that carved out the terrain and waterfalls that would majestically appear before your eyes - this is exactly what happened as we approached Seljalandsfoss Waterfall. It was absolutely breathtaking! Continuing our journey towards Vik we headed to our next destination which was Skogafoss Waterfall. I don't usually like to play favorites, but this was hands down my favorite waterfall while in Iceland! The power and beauty of this waterfall is incredible not to mention the amazing view that you get when you climb the stairs to the very top! You can then hang over the edge of the cliff while the waterfall cascades over. My fiance couldn't look over, but if you love heights I recommend taking the moment to because you will not regret it! Once back on the ground there were quite a few people in front of the waterfall so I recommend doing what I did which was moseyed through the crowds to get right up to the front. I got a little drenched (that's why you wear waterproof everything in Iceland), but captured the most stunning shots while standing in front of the falls. Plus, a full rainbow appeared above me too! Such a stunning moment. 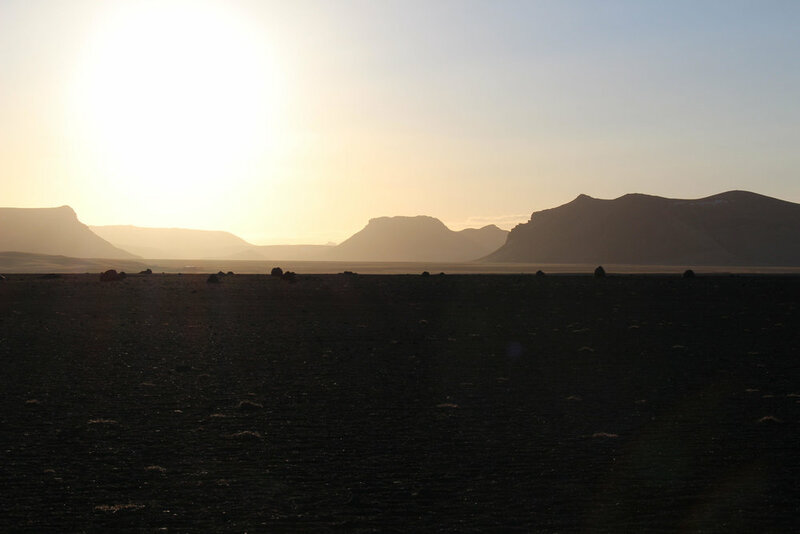 With an incredible journey slowly coming to an end the sun was beginning to lower in the sky and we finally arrived at our final destination which is right outside of the town of Vik - the Black Sand Beach! This incredible beach has some of the most beautiful views and rock formations. Iceland is known for these gorgeous six-sided rocks called basalt columns which are formed from lava quickly cooling. You'll find them throughout Iceland, but none quite as remarkable as the formations at the Black Sand Beach! We sat on the beach for a little while taking in the views and watching the sun slowly set in the sky. It was the perfect way to end our fun-filled day. If you have some time like we did I recommend venturing around the area as well to Dyrhólaey which has some killer views - it's only a few minutes away. We ended our evening stopping at the local grocery store Krónan in the town of Vik to stock up on breakfast items which included apples and Icelandic yogurt (make sure you try their yogurt its heaven!). We also purchased some almond butter, jam, and bread for quick on-the-go lunches accompanied by a large bag of trail mix to snack on. I can't recommend enough for you to make sure you stop at a grocery store and stock up on these easy meals to make on-the-go. It not only saves you money but also saves you time for busy days! As for water do not buy bottled water in Iceland you may get a few stares and few laughs! Iceland has some of the tastiest water from the faucet so fill up anywhere with a reusable water bottle. After our grocery store stock up we headed to our Airbnb which was located right in front of the road leading towards the Black Sand Beach - super ideal spot with the most stunning country views and awesome amenities! You can check it out here. On day 2 we got up early and began our drive to Skaftafell National Park. Today was the day that we were going to hike a glacier! What an incredible experience this was. Upon our arrival, we got geared up and bused over to the glacier where we began our amazing journey from the base of the glacier tongue to the top. There are no words to describe this experience as it was beyond anything I have ever done! It also allowed me to see first hand the effects of global warming and how it's impacting our planet. Soon this glacier will retreat so far back it will be non-existent. Seeing it melt before my very eyes truly hit home too. It's sad. It's real. It's so important to see first hand what is happening around us and make changes in our lives to live greener! If you want to experience this amazing moment too I highly recommend checking out the tour guide we did - it was incredible! You can find their details here! After our amazing glacier hike we continued our adventure up the eastern coastline to Jokulsarlon. This incredible site houses differing sizes of glacier ice which have broken off into the lake. I recommend stopping at one of the many stops prior to making it to the main entrance as you can get a less crowded experience. There is also nothing quite like walking over the hillside after parking only to find this glorious picture above! Jaw dropping beauty my friends and so serene. 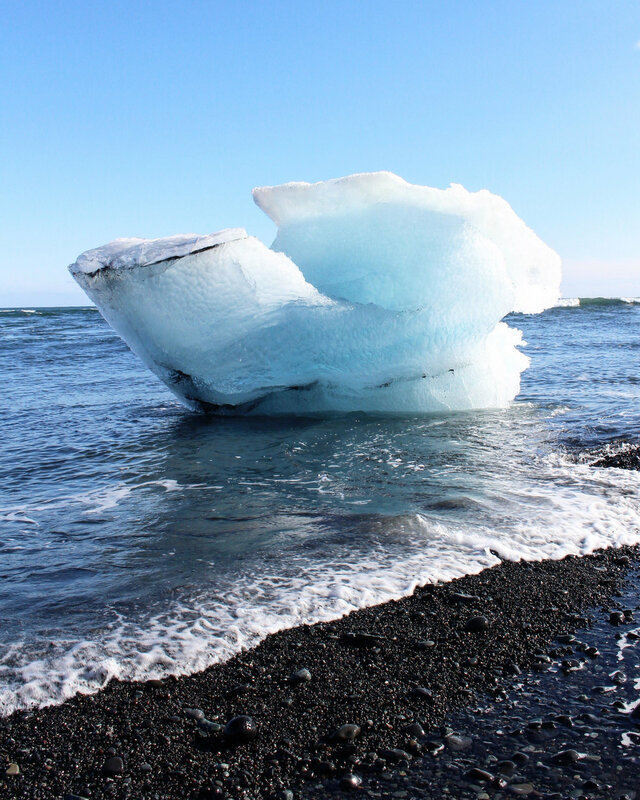 After hiking around Jokulsarlon we stopped at the famous Diamond Beach. Jokulsarlon lake connects into the ocean and then the broken off ice pieces wash back up onto the beach creating Diamond Beach. Many of the glacier pieces get tossed around on the beach over time creating these gorgeous smaller, clear, and sparkling diamond like pieces of ice. Truly beautiful! After spending some time at Diamond Beach we began our journey back to Vik where we ate a delicious dinner at Sudur Vik. What we didn't splurge on for breakfast and lunches we did for dinners. This is an incredibly smart way to travel - especially in the most expensive country in the world! On our 3rd and final full day in Iceland we got up early again to make the most of our day. Today we would begin our travels back west where we would end our day in Reykjavik, but of course not before we pack our day full of amazing stops! 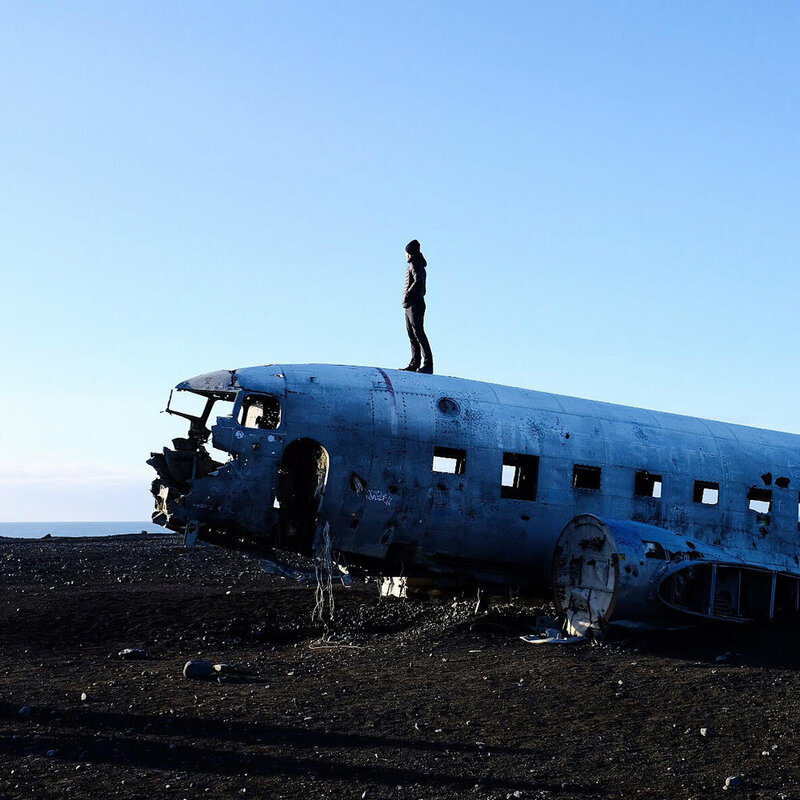 Our first stop was a few miles west of Vik - the Sólheimasandur Plane Wreck. My fiance and I did not plan to make this stop because we did not know if we would have time, but we made time early in the morning before it was filled with tourists and I'm so glad we did. I should mention to all that this will take you about 30-40 minutes to hike to and another 30-40 minutes to walk back to your vehicle so you will want to plan accordingly. I did not believe that it would truly take this long to get to the site from what blogs were describing, but believe me when I tell you it will! If you're up for it I say go for it! Heck, you're in Iceland so live it up! Plus, the entire hike and experience makes you feel like you're on another planet. So what's better than that?! After the amazing hike to the plane wreck, we drove a while west and then north to Geysir. It's pretty incredible to see in person how active Iceland is! I recommend stopping at the Geysir Center to grab a coffee and a bite to eat. We took a coffee to go and explored the area. It was an awesome experience! This is also a great place to snag some souvenir items (if you're into that) - they have a grand selection. After some awesome photos of the Geysir and other super cool active pools, we snagged some sandwiches to go and drove to our next destination! A few miles down the road from Geysir you will find Gullfoss Waterfall. A massive waterfall in Iceland and the largest that we saw on our adventure! It's quite magnificent, but unfortunately the bottom portion was closed off a bit so we couldn't get too close. However, you can climb some stairs to get some wicked cool views from above which you can see in my photo. It was such a stunning view! As we continued our journey to Reykjavik we made one last amazing pitstop at Thingvellir National Park. This park is quite remarkable as you venture in. Mountains surround this beautiful lake. There are so many hiking trails to follow so I recommend making your own plan and just taking some time to mosey about. It's quite beautiful and next time we visit Iceland we will definitely spend a lot more time here!! We didn't realize how incredible this national park truly was. We were unable to dive Silfra, but if you choose to do so you can book a dive between two tectonic plates as well. The water is unbelievably clear and it's on our bucket list for next time! For our last evening we decided to stay in the capital city of Reykjavik! For us, we wanted to spend more time seeing the country and major destinations rather than just spending time in the city! The city was beautiful and quite modern with the most adorable main street with some awesome shops and cute little stores. We ate at a fabulous restaurant called Matur og Drykkur. A fantastic fine dining experience that we cannot rave enough about. The evening came to a close and our adventure began to settle down as we moseyed back to our Airbnb which you can find here! It was located beautifully a few blocks away from the hustle and bustle of main street. There was one last magical piece to our adventure that happened as well - my partner asked my hand in marriage on our last night together!! Can you believe it?! Of course I said YES! What a way to end our amazing Iceland journey! I hope you enjoyed this and are now feeling inspired, packing your bags, and gearing up for your adventure to Iceland! In only 3 days you can do all this and more!